Well if this isn't just the cutest little psycho killer I have ever seen. 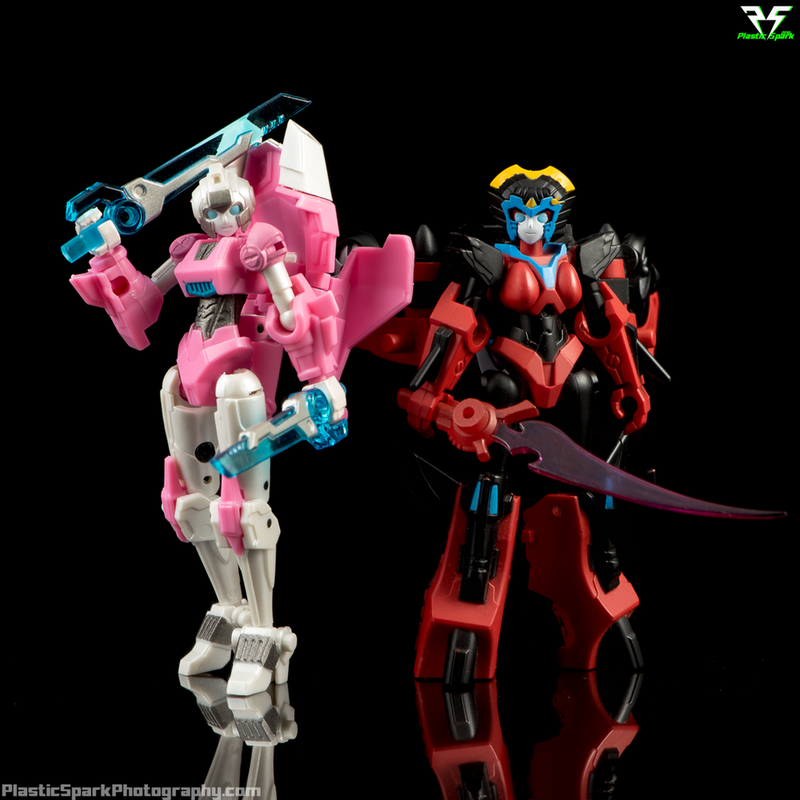 I'm not much of a legends collector but I have a soft spot for cute female Transformers interpretations. 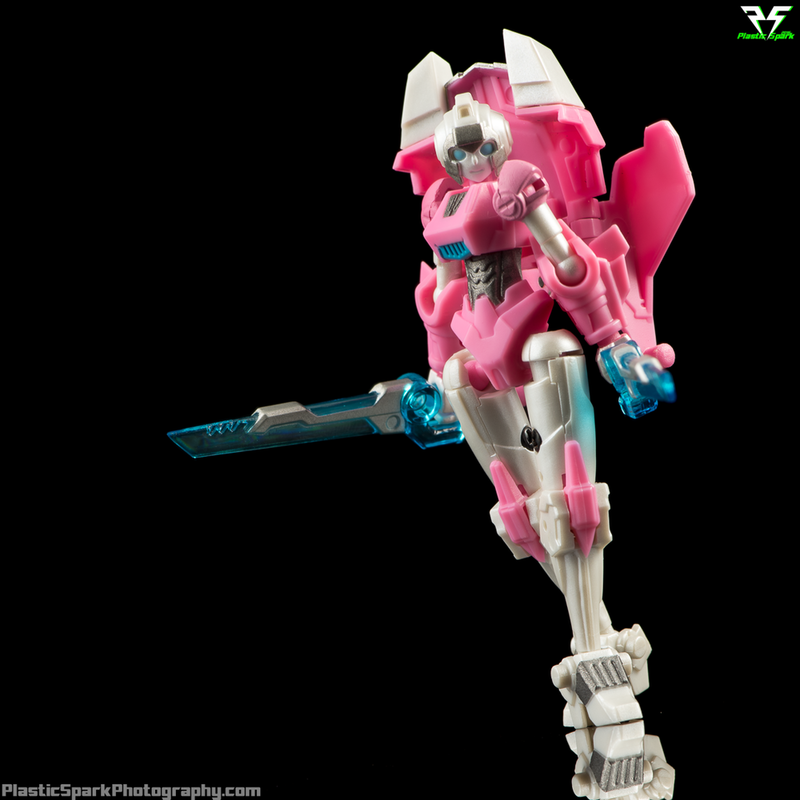 Iron Factory's Pink Assassin appealed to me from the minute I saw the first prototype photos and I knew she would end up being a part of my collection eventually. At an asking price of $20 USD at most retailers I didn't have to wait and snapped one up immediately from A3U during their one day flash sale for $15 USD! Let's get to it and see if she was worth the buy in! "Cute right? 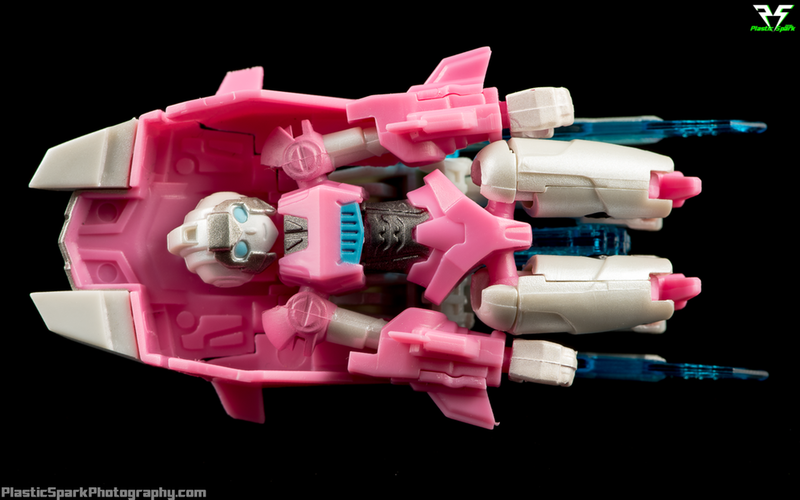 Come here and say that..."
Assassin's vehicle mode is a small compact rendition of Arcee's traditional Cybertronian cruiser. 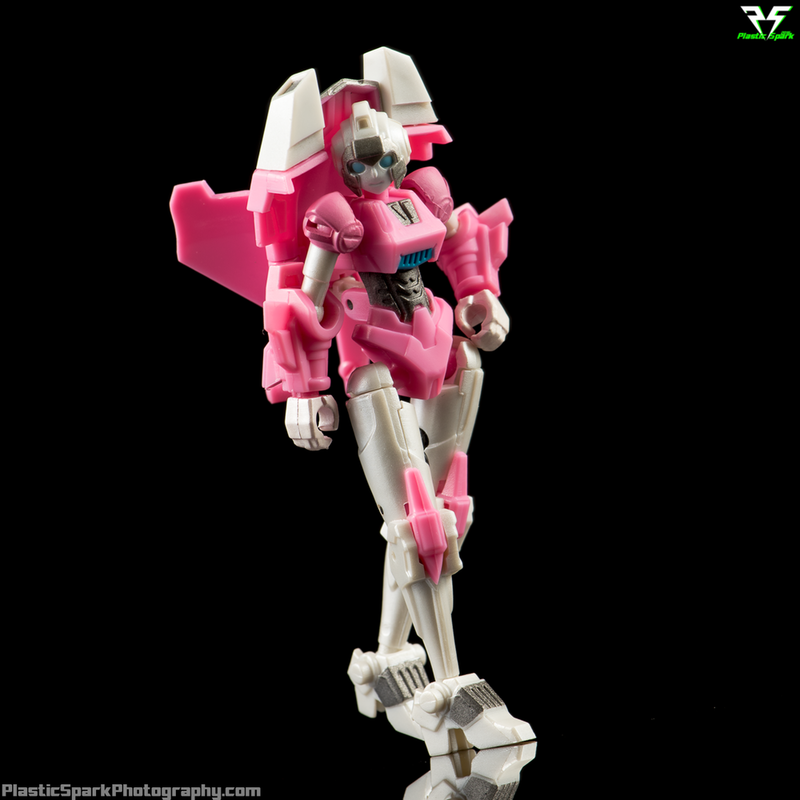 The aesthetic seems to be inspired by a mix of G1, IDW, and the Generations Arcee figure we got a couple years ago. Her hands are visible in alt mode and it's pretty obvious that the rear of the vehicle is simply her legs folded up over the top. As far as alt modes go it isn't the cleanest but at the legends scale I think it's effective. She has storage for all her weapons as well which is awesome! The vehicle mode does not sit flat on the ground, it will rock backwards due to the curvature of her legs. This is a bit of a pain if you wanted to put her on a shelf in vehicle mode but really who's going to be doing that? I'm sure no one will notice those swords... or hands. 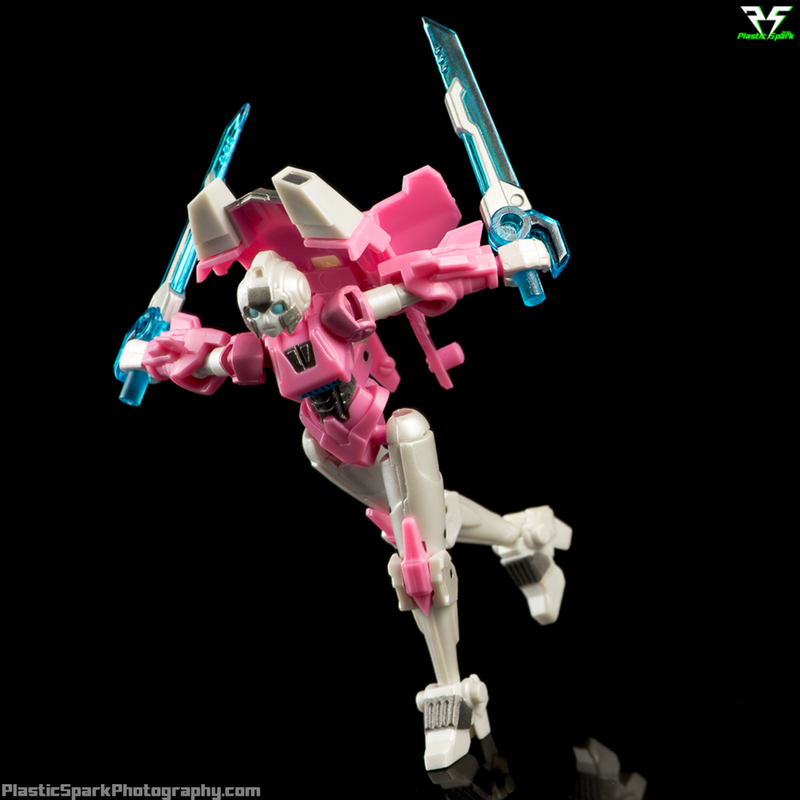 I found that sticking the swords into her exposed hands can give you a makeshift flight mode similar to the Mastermind Creations Azalea and her variants. This is not an official mode for Assassin but I think it works well enough and it looks fun. The included stand doesn't have any sort of peg hole to plug into when she is in vehicle mode but the peg is large enough that I was able to balance her on the stand using one of the gaps on the underside. She comes packaged in robot mode but the transformation to vehicle mode is simple and intuitive, no need for instructions though they are included in the package as well. Sword Wings. Stuff can be two things. 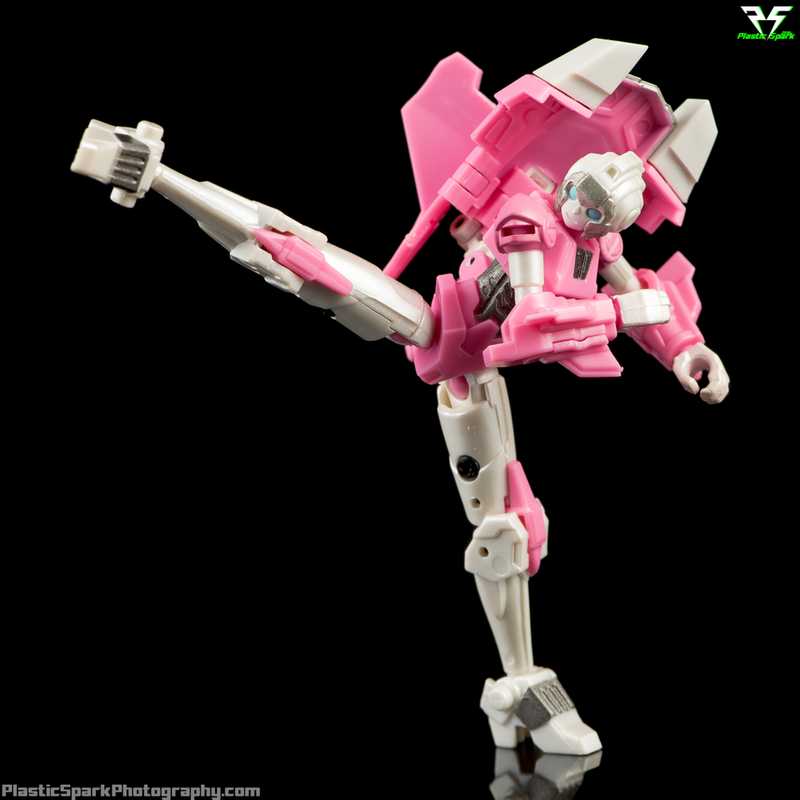 True to form Pink Assassin turns into a legends scale homage to the Transformers character Arcee. Similarly to the vehicle mode she seems to be inspired by her G1 rendition as well as the current IDW comics designs. Her proportions are excellent and the paint finish is fantastic. I would have been incredibly easy to just mould this figure in white and pink with some blue details but Iron Factory didn't settle for the simple solution. All the white components on Assassin have a pearlescent finish that looks amazing in hand and in photos. Like a doll. A doll with swords and a temper. The only real point of contention on this figure seems to be the face. It's a simple design similar to Iron Factory's previous Windsaber figure. Large moulded and painted blue eyes with a small nose and simple smile adorn a nearly perfect round head. The face can have a bit of a “killer doll” sort of look and can seem unsettling depending on her pose and your viewing angle. I think the face fits the design but there is certainly room for improvement as well. Riiiider Kiiiiick! Whoops wrong franchise! I was absolutely not prepared for this articulation. 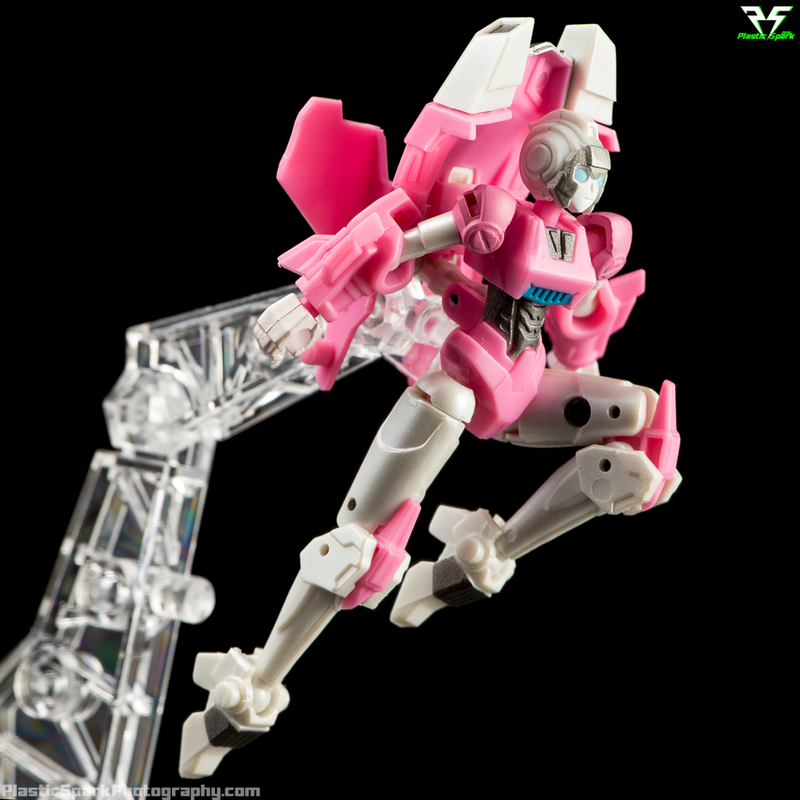 Iron Factory's Pink Assassin sets a benchmark for not only legends scale figures but even deluxe and voyager scale! She puts almost every mainline Hasbro figure I own in those size classes to shame! From the top down let's go over her joints. She's got a ball jointed neck with a great range in all directions for a range of expression. Her shoulders are on ball joints attached to the body that allow for just under 90 degrees outward and full 360 rotation. It would have been nice to see a double ball here but honestly aside from her inability to hold a tree pose I didn't find this all that limiting when coupled with the rotation. She's got ball jointed elbows that double as a bicep swivel with around 90 degrees of bend. Am I the only one unsettled by that smile right now? Pretty standard stuff so far but here's where things start to get crazy. She has a ball joint in her upper torso where the bust and abdomen separate that allows for an ab crunch as well as an upper body rotation in place of a waist swivel. 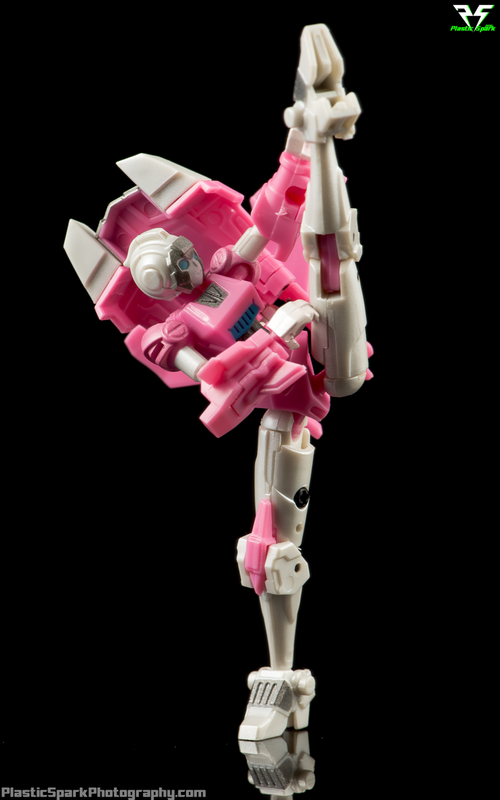 Her hips are simple ball joints with a cut to allow her legs able to go out a full 90 degrees for a full flat on the ground split. On top of that, the way the pelvis and hip area is moulded allow for her leg to swing all the way around on the ball joint so there is literally no position she can not reach with her legs. There is a dedicated sleeve style thigh swivel! This is insane and I absolutely did not expect this kind of articulation on a figure this size. Iron Factory went the extra mile here for sure! Double jointed knees and ball jointed ankles that allow for ankle tilt and pivot. A cut in the front of the ankle to allow the foot bend upwards a little more would have been nice but there is a fantastic amount of swivel and toe point. There was not a single pose that I wanted to put Assassin into that I couldn't achieve. This figure is nearly perfect when it comes to articulation. Throw in ball jointed wrists and double elbows and this figure would be absolute god tier posability. I've got nothing clever. I'm still in shock. Pink Assassin actually ships with a surprisingly large amount of accessories for such a small and affordable package. 2 x Energy swords. The swords look great, moulded in a translucent blue with some silver paint details to ground them as physical weapons rather than pure energy. She can store them on her back wings in bot mode as well. 2 x Energy pistol. 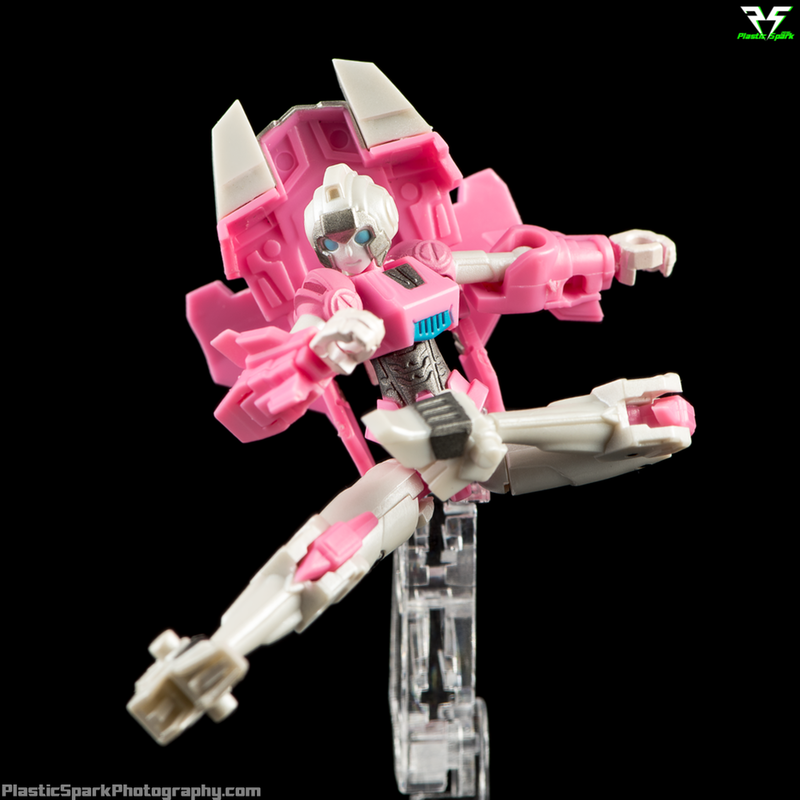 A simple pistol similarly styled to the one that came with Generations Arcee. Moulded purely in the same translucent blue as the swords this gun looks good but I would have liked to see some silver paint on here as well. Can also be stored on the backpack. 1 x Translucent sword for Windsaber. Included as a first run bonus, Assassin comes with a replacement sword for Iron Factory Windsaber with a translucent purple blade. The original that came with Windsaber was painted in solid purple. This looks great with Windsaber, and even if you don't own the intended figure you can use this sword with Pink Assassin as well. Let's play a game of "Which one wants to murder me"
1 x 5 piece Transparent display stand. This was a nice surprise when I first saw solicits for PA. Iron Factory included an incredible display stand. The stand is made of 5 pieces, the base, the main riser, the secondary arm, and 2 mounting posts in 3mm and 5mm sizes. The stand clips together very tight and it is incredibly stable. You may get some plastic squeak or snapping noises when adjusting the arms the first few times. This will go away after a few adjustments and I haven't noticed any cracks or stress marks like I do on my Tamashii stands. I like that they included both 3mm and 5mm mounting posts so that this stand can be used for a number of figures in your collection. This was a great addition as I have found myself constantly wishing I had a display stand with a 5mm port as all the Tamashii stands are 3mm. 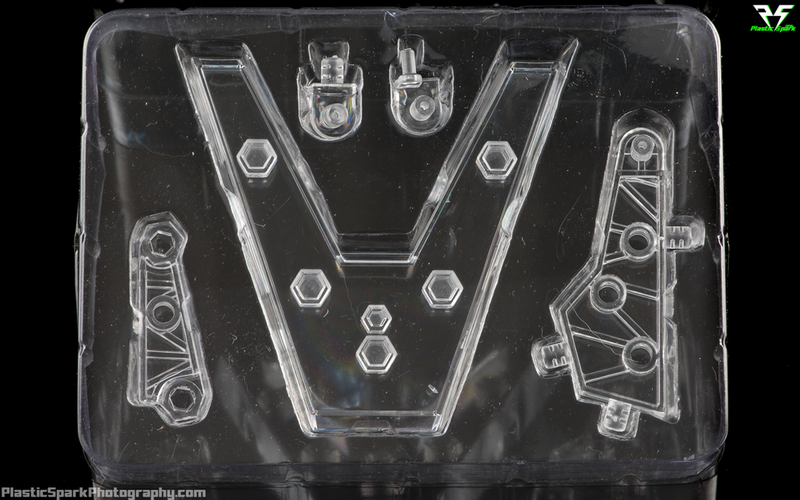 PA has a 3mm port on the back of her pelvis that can be plugged in to the stand for dynamic robot mode poses. I was able to use the 5mm adapter to plug in Windsaber using the ports on the bottom of her turbine blades. There are also multiple mounting points on the base so you can add more arms for dynamic display options, Tamashii arms fit in perfectly. I would legitimately buy more of these stands as a standalone item. Sure let's call that a jetpack. 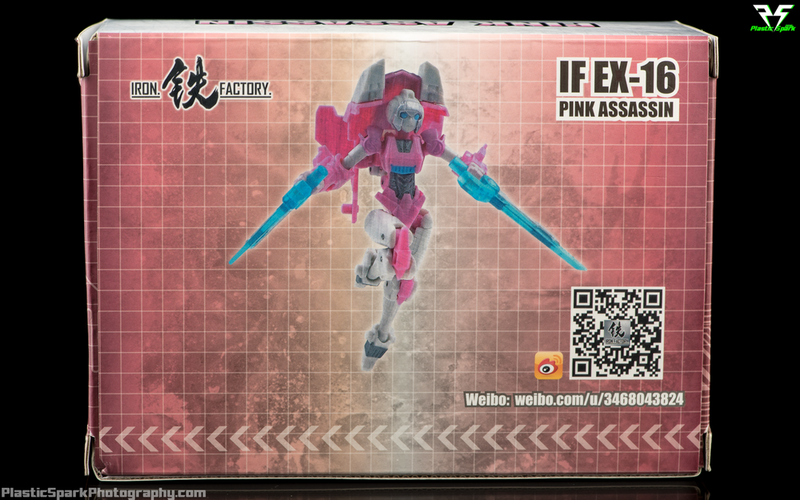 IF EX-16 Pink Assassin is the complete package. Iron Factory continues to impress with every release and this is no exception. Solid design work, a simple and intuitive transformation and unmatched articulation at this scale make Pink Assassin one of my absolute favorite figures in my collection right now. The inclusion of so many accessories including a fully featured figure stand is absolutely mind boggling when paired with the incredible retail asking price of $20 USD. This is a figure that I absolutely recommend to any action figure collector regardless if you're a Transformers fan. Iron Factory is a company that is always on my radar due to their character choices and feedback from fellow collectors but many of their releases are just slightly out of the price range I can justify for legends scale releases despite their fantastic quality. I'm incredibly happy that even at this reduced price point there are no sacrifices being made, Iron Factory brings the same amazing attention to detail and articulation regardless. Bravo Iron Factory, stand up and take a bow because you guys knocked it out of the park on this one and you have a customer for life in me! If you are even slightly on the fence about this figure you need to pull the trigger. You absolutely will not be disappointed! This is easily one of my top 5 favorite toys of 2016. Check out the full gallery below and let me know your thoughts in the comments section! Any questions or requests for specific photos and comparisons can be sent to plasticsparkphotography@gmail.com.